WooCommerce Services helps get your store “ready to sell” as quick as possible. You create your products. We take care of tax calculation, payment processing, and shipping label printing! 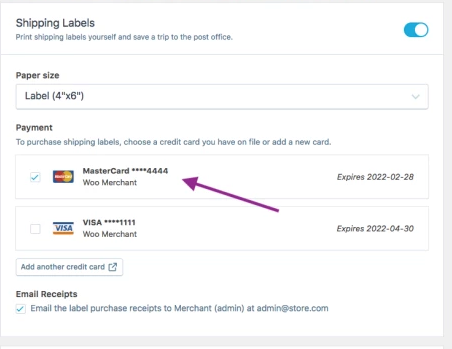 Have a Stripe account setup on your behalf or accept PayPal Express Checkout payments with just your email address. Opt for Automated Taxes – tax rates are set up automatically; no need to enter them manually. Offer lower rates on shipping. Create ready-to-print shipping labels for USPS directly in WooCommerce and take advantage of our special discount. Labels cannot be generated for Canada Post at this time. NOTE: Jetpack must be installed and connected to WordPress.com to work with WooCommerce Services. See Installation instructions below. Get the WooCommerce Services plugin. Install the plugin. Go to WordPress Admin > Plugins > Add New and search for WooCommerce Services, or upload the plugin downloaded from WordPress.org. Then install and activate. Follow the prompt to connect your WordPress.com account. This is the same account you use to log into WooCommerce.com. Go to the Setup and Configuration section. WooCommerce Services allows you to define custom packaging that you’ll use for shipping. 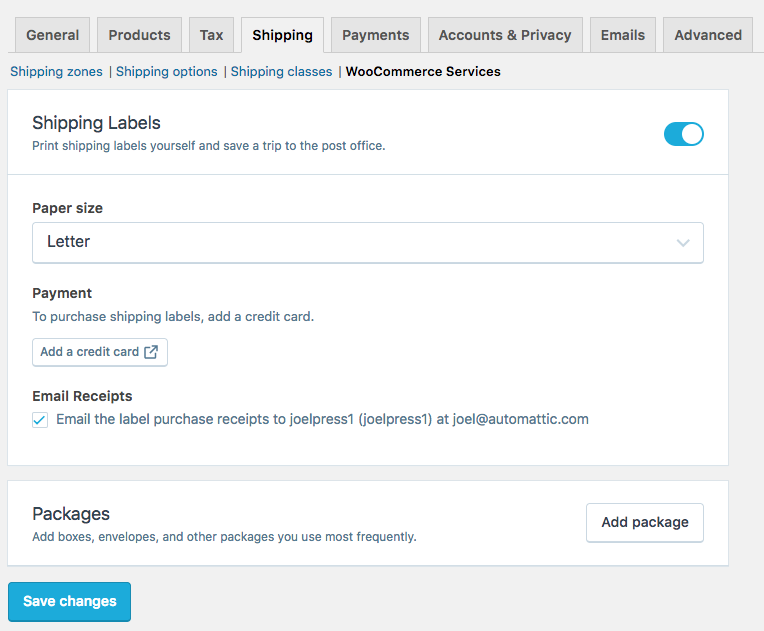 To manage packages, go to WooCommerce > Settings > Shipping > WooCommerce Services. Inner Dimensions are used for calculating package volume, meaning how many products can fit into the box, based on the product dimensions. Outer Dimensions are used for calculating shipping rates. For example, a standard padded envelope may have Outer dimensions of 6″ x 9″ but Inner dimensions of 5.5″ x 8.5″ due to padding and envelope thickness. If you don’t use custom boxes, select one or more of the options available in the Service Package section (provided by courier). Flat rate packaging is used automatically if you selected flat rate services in your shipping method. WooCommerce Services currently only supports printing shipping labels for USPS shipments. Go to WooCommerce > Settings > Shipping > WooCommerce Services. Once you have a payment method selected, you can now print shipping labels for your orders! Enter the full address you’re shipping from, if it’s the first time printing a shipping label. Choose a signature requirement (optional). Select the desired shipping service (rate). After clicking Buy & Print, label(s) are automatically open in a print dialog. Some browsers, like Firefox, can’t automatically open the labels for printing. Click the blue Print button. You can also reprint your label or request a refund, if necessary. When editing an order select the three ellipsis menu to see those options. It is important to measure and weigh your packages carefully, and to choose the correct service especially when using US Postal Service provided packaging. The US Postal Service now automatically measures and weighs packages and we will bill your credit card for packages found to have insufficient postage. For more information, please see Understanding the US Postal Service’s Automated Package Verification (APV) System. You can review your past label purchases in one place by navigating to WooCommerce > Reports > Shipping Labels. On that page, you can specify a time range for which a report should be generated and export the report as a .csv file. To enable automated tax calculation, first ensure that “enable taxes and tax calculations” is checked on WooCommerce > Settings > General. With taxes enabled, go to WooCommerce > Settings > Tax, select “enable automated taxes” and click “save changes”. Note: automated tax calculation depends on prices to be entered exclusive of tax. For stores based in the EU, we recommend using our EU VAT Number extension in addition to automated taxes. WooCommerce Services no longer provides live shipping rates to new stores as of the release of WooCommerce 3.5. Live rates will continue to work for stores currently using them. Live shipping rating requires that non-virtual products have weights and dimensions set. More info at: Adding Dimensions and Weights to Products for Shipping. Add a USPS or Canada Post shipping method to an applicable zone. Note: USPS is only available for stores accepting US Dollars, and Canada post is only available for stores accepting Canadian Dollars. Name the shipping method to be displayed for your use, and enter the post code you are shipping from. 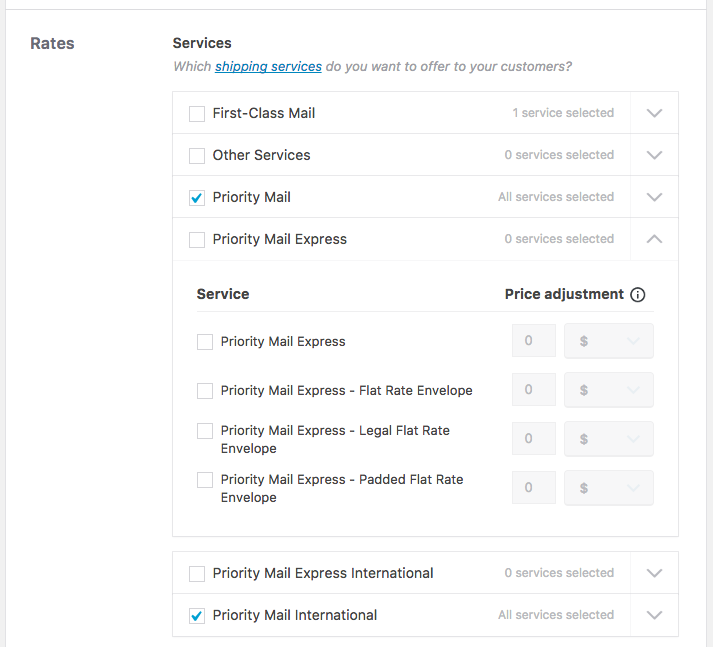 The origin ZIP code will default to the value set in WooCommerce > Settings. Select the carrier services you want to offer. By default, Priority Mail services are selected. Enter any price adjustments, if applicable. Price adjustments can be useful to help cover your costs for shipping supplies. This will add an additional cost to the final shipping price, shown as one price to your customer. Select which rates to offer customers. Enter a fallback shipping cost (optional) and what rate class you want to charge. This will allow the customer to check out if USPS can not return rates, charging the fallback rate instead. USPS offers two shipping class rates: Retail and Commercial. Retail rates are the standard rates that USPS charges for shipping. This is what you would pay if you take your package to a USPS post office for shipping. Commercial rates are the discounted rates available via special agreement with USPS. If you select Commercial rates, your customers are charged the agreed upon discounted rate. Select which rate to offer. Select the method of box packing to use. To diagnose issues with your WooCommerce Services setup, go to WooCommerce > System Status > WooCommerce Services. If you’re experiencing issues, enable debug and/or logging. The system status page displays issues that could cause WooCommerce Services to stop functioning and contains helpful debug information, plus links to get further assistance. USPS or Canada Post shipping method is missing. If you don’t see the USPS or Canada Post shipping methods when adding a method to a zone, check your store’s currency setting. USPS is restricted to stores using US Dollars, and Canada Post is restricted to stores using Canadian Dollars. Note: you may need to refresh your WooCommerce Services data after changing currencies. Go to WooCommerce > Status > WooCommerce Services and click Refresh. The “create new label” button is missing from the Order Details screen. 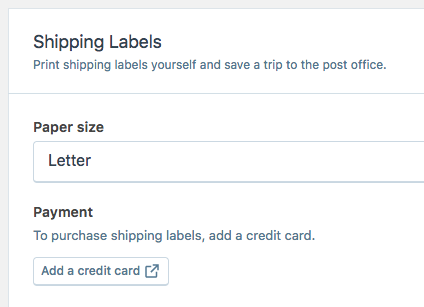 If your order meets the criteria outline above and you still aren’t seeing the “create new label” button, please create a ticket containing the relevant order data so we can help diagnose the issue. You may encounter this error when printing shipping labels. This means that we were unable to verify the address with USPS – it may have been entered incorrectly, or isn’t considered “deliverable” by the post office. Use the USPS zip code lookup tool to verify the address. If it’s not recognized, we recommend reaching out to your customer. If the tool recognizes the address there may be an issue with WooCommerce Services. Please open a ticket with the relevant address information so we can look into it. Automated Taxes do not appear to be calculating. More at: When Online Sellers Should Collect Sales Tax. Several things can prevent shipping rates from being calculated, including problems with the USPS API service. Most issues can be diagnosed by looking at the Debug Log at WooCommerce > Status > WooCommerce Services. Product is missing weight or dimensions. Solution: Ensure that your products have weight and dimensions, then try again. There’s an error with Jetpack Authentication. Solution: Reconnect Jetpack. More details at: Fixing Jetpack Connection Issues. Unable to connect through Firewall. If you are using a security plugin or have a firewall, it’s possible that connections to our servers are being blocked. To resolve this, you can whitelist our server. Outgoing requests from this plugin are only made to api.woocommerce.com, this is currently the IP address 192.0.96.246. Update your details, and click Validate address to save. These details will be saved for use on future purchases.